Joe Walnes | Software development. And stuff. A while back, I backed a Kickstarter: Blink(1) – The USB RGB LED. In a world of next-day instant-gratification deliveries, it’s always a pleasant surprise when something you totally forgot about ordering turns up. It fits neatly into the spare USB port under an Apple keyboard. Time for a Pomodoro hack – make something useful in 25 minutes. No time for over-engineering – hack fast! Minutes 0-3: Unpack Blink(1), download command line tool, and test it out. Looks good. Minutes 4-14: Read the API docs for Google Latitude. Tried really hard to get authentication working but realized I was burning time. Arrrg, the pressure – this is taking too long! Aborted and looked for a quicker way. Minutes 15-18: Found a quicker, hackier way to get Google Latitude data. Worked! Minutes 19-22: Hacked up a quick Python script to poll Google Latitude, and convert the coordinates to a value from 0.0 to 1.0 where 0.0 is home, 1.0 is work and 0.5 would be half way between. Minutes 23-25: Based on the number, call the blink1-tool command setting the color to indicate my location. (Ok, I cheated a little – I spent another Pomodoro cleaning up the code, adding comments, etc and another 2 Pomodoros writing this blog post). Remember a few weeks back I announced resisto.rs, a no-frills resistor color code calculator? Welllll, if you happen to be a user of DuckDuckGo, it’s now even easier. See the resistor colors directly in your search results! Try it out at DuckDuckGo. And thanks to DuckDuckGo for making it so easy to extend your search engine. I never have a resistor color chart handy when I need one. So I built a little web-app. Fast loading, simple, mobile friendly, and to the point. It’s a little PCB I designed to make it easier to experiment with electronics and the Raspberry Pi. Really compact – sits inside the surface area of the Raspberry Pi and adds less than 2mm to the height. 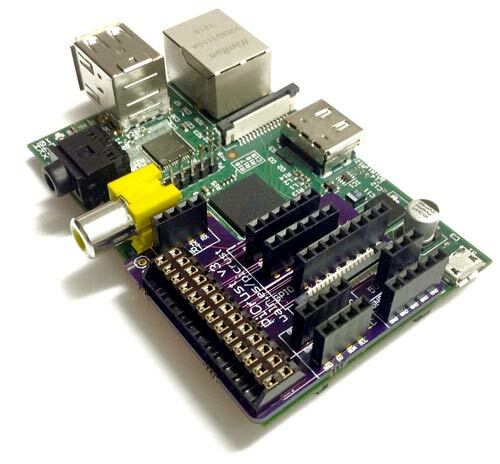 If you have a case for your Raspberry Pi, this board may well fit inside it. 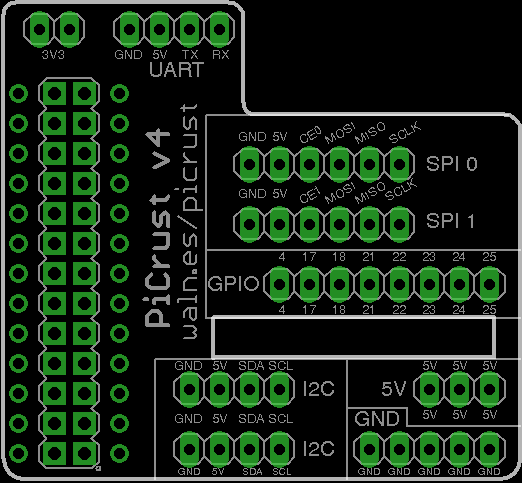 Pins are grouped together: GPIO, I2C, SPI, UART and power. Every pin is clearly labelled. Connections: 2 x SPI, 2 x I2C, 1 x UART, 8 x GPIO. Uses female headers instead of male headers – you can poke jumpers right in. 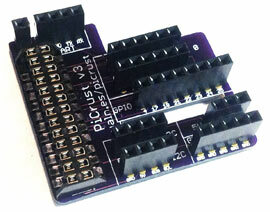 Lots of GND and 5V pins – you need those guys a lot. These pins are duplicated where it makes sense (e.g. within the UART, I2C and SPI groups). All thru-hole components – you can solder it yourself. 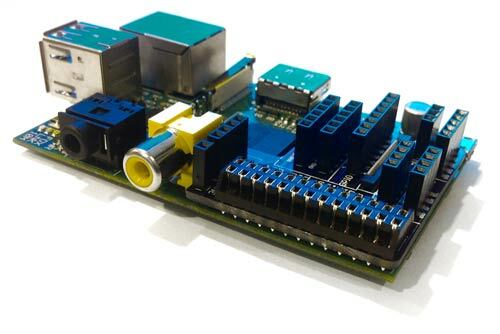 There are lots of other boards out there, but this is unique in that it fits nice and snugly against the Pi, keeping your projects compact. 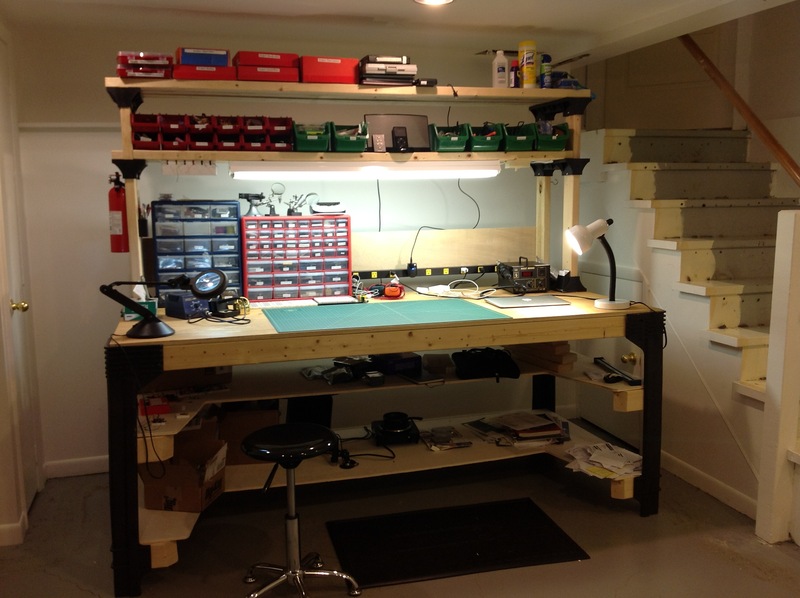 Tip: Amazon 2x4s basics – a great way to build a workbench. Just add wood. Tip: For electronics work, I find it more comfortable to stand. The black mat on the floor is one of those soft mats that make it easier to stand without getting tired. Tip: If you take the standing option, it’s handy to have a stool – just in case. 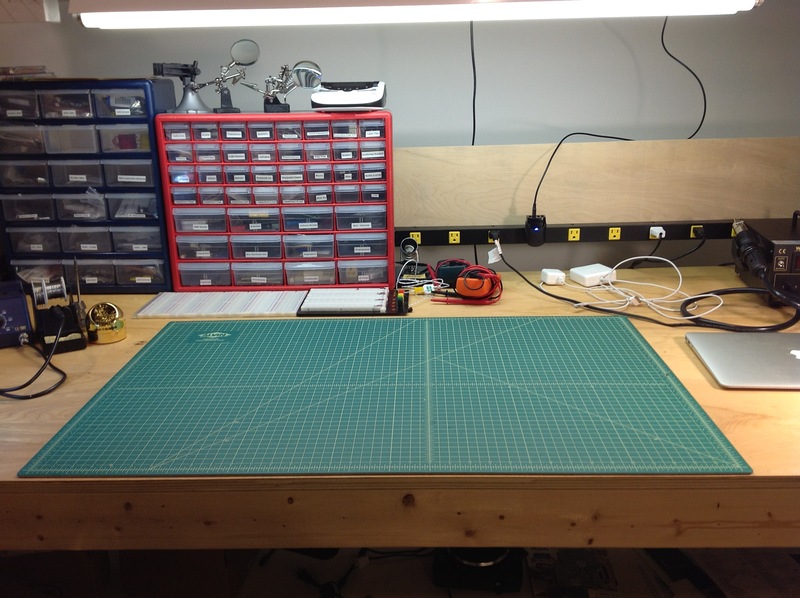 A a large craft mat where I do my soldering. Protects the desk, makes it easy to clean and find little components. 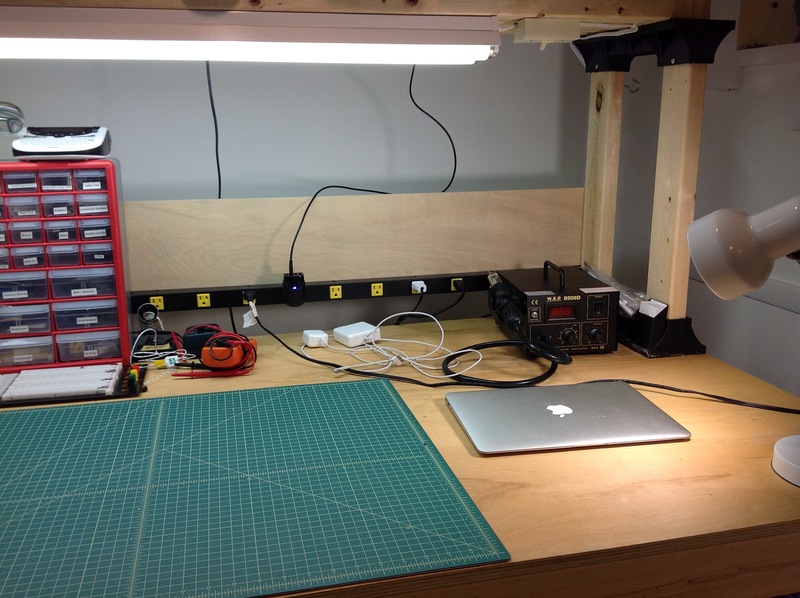 Tip: If you’re left handed, put the soldering iron the left of your main work area. Makes it so much easier – before I did this, I kept getting tangled up. 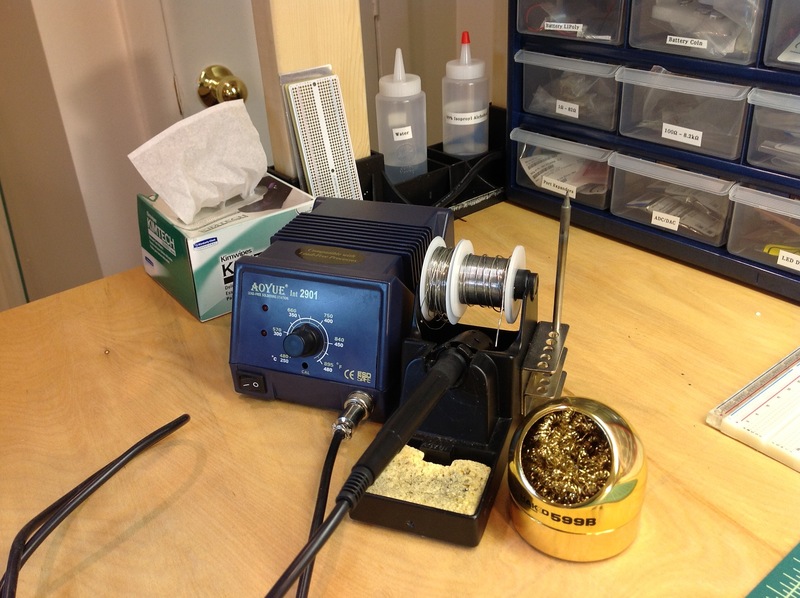 Tip: I have two solder spools – a chunky one for through-hole components, and fine for surface mount. Tip: Keep a bottle of water handy for wetting the sponge without having to leave the room. Tip: Even better, use a brass sponge – no water required. 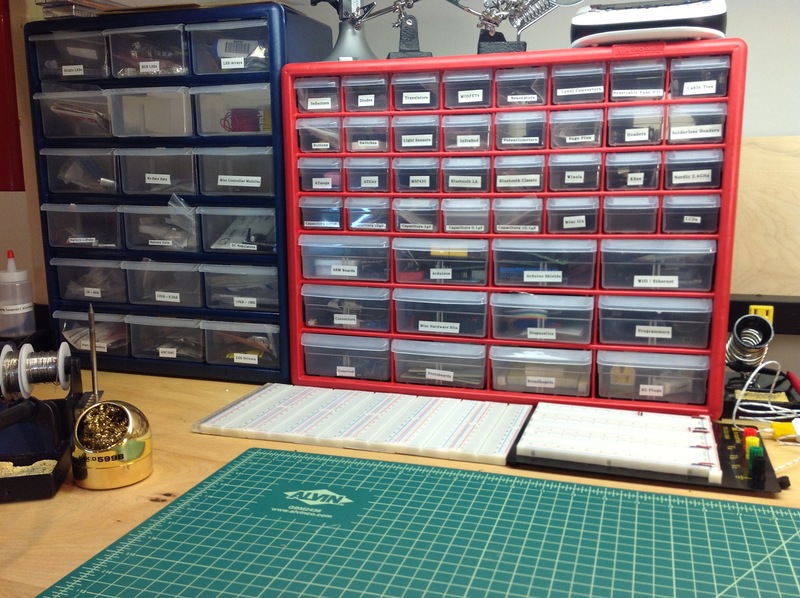 I organize all my through-hole components and board into these drawers. Tip: Keep everything in reach. 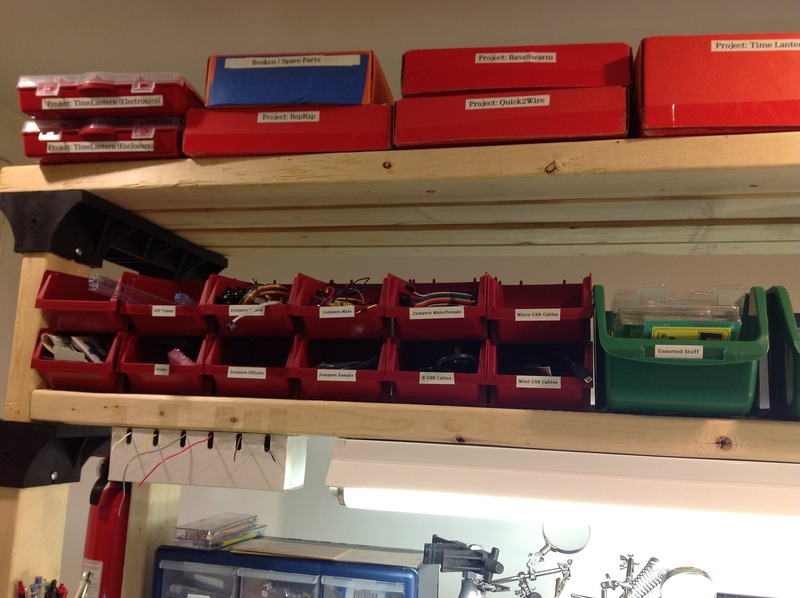 Tip: I have an ‘unsorted’ drawer that I sweep components into when I’m done. Every once in a while, I’ll sort through this drawer and put everything back where it came from. 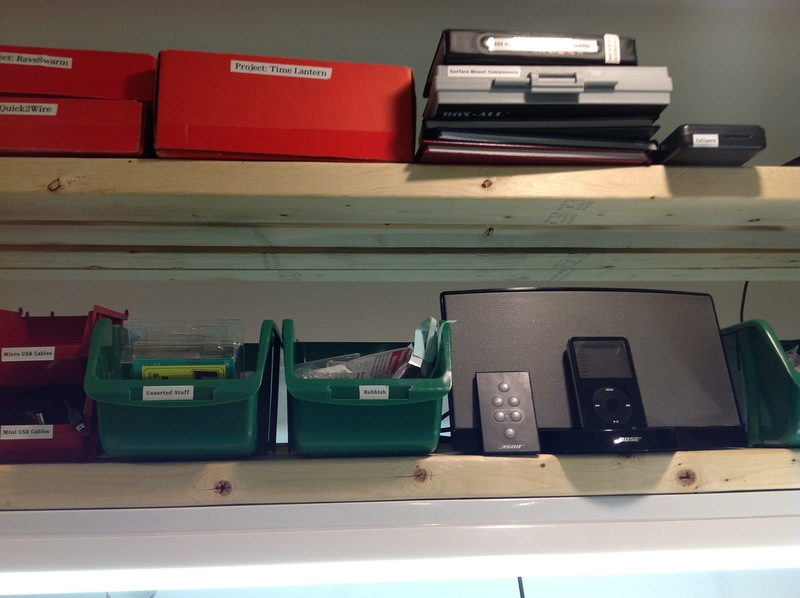 Tip: For components like resistors and capacitors, split them into multiple drawers of ranges. Tip: You can never have too many power outlets. Tip: Lots and lots and lots of light! Tip: Get cheap stackable storage containers. I use these for things like cables and tools. Tip: Keep all the cardboard boxes you get sent components in. They’re really handy for grouping projects together. 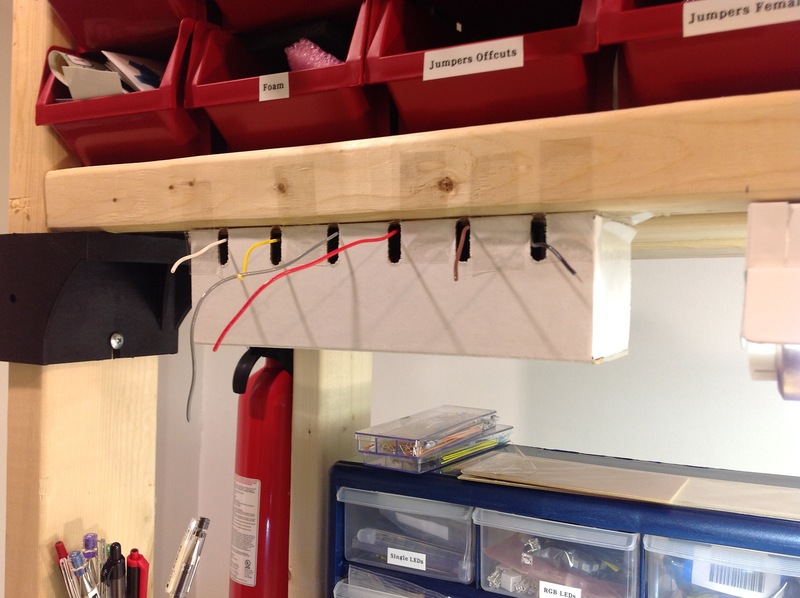 Tip: Easy to access hook up wire box. Held in place with tape. Tip: Yes, that’s a fire extinguisher at the back. I’ve never needed it, but I feel a lot better having it nearby. Tip: Phat choons to work to. 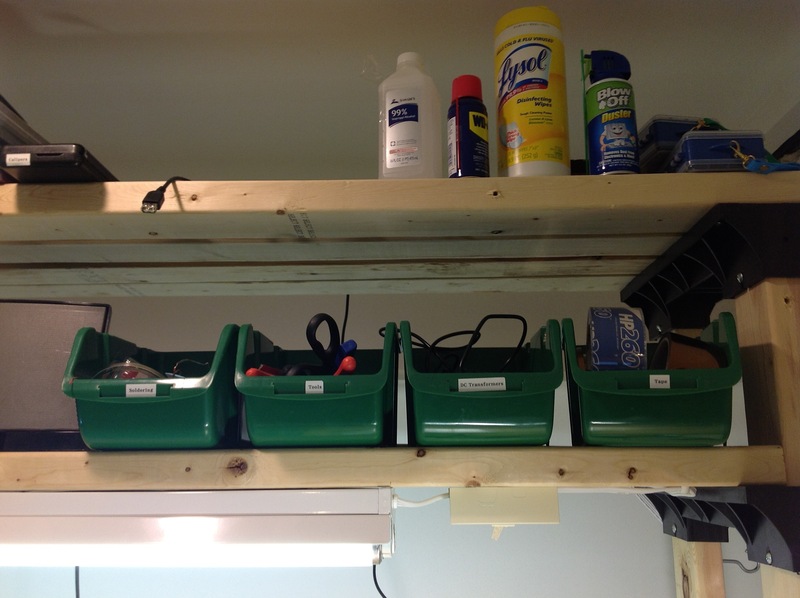 Tip: The little grey box on the top shelf, just right of the middle: that’s where I keep all my surface mount components. They’re a lot easier to manage than through-hole. Tip: Every time you store a component, cut out the label with the part number, so you can easily Google the datasheet or order more when you come back to it later. Tip: Keep tools, cables and soldering supplies in these little containers, and get the entire container down when you need it. 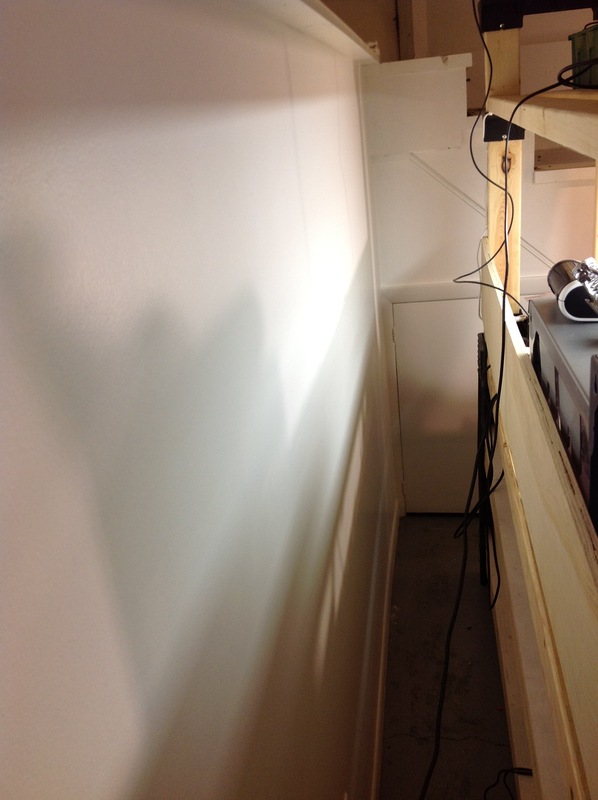 Tip: Leave space behind your desk, so you can easily get behind it to plug things in, re-wire, etc. Smoothie Charts has a new website. Rather than add to it, I ended up taking stuff out. It’s simple and to the point. It also works well on mobile / tablets. Just received a Raspberry Pi. Thought it would be fun to try and hook the GPIO pins up to a shift register. This would allow a few pins to drive many more.